It's now Australia's turn to deal with the so called "Choosing Wisely" campaign that has caused a great deal of turmoil in the United States. Ever since the American Chiropractic Association (ACA) adopted the standards the ACA has been in the midst of an internal struggle after it became obvious that the radiology standards they adopted are a threat to public health. The Choosing Wisely guidelines were rejected by several chiropractic organizations including: Sherman College of Chiropractic, the Foundation for Vertebral Subluxation, ChiroFutures Malpractice Insurance Program, the International Federation of Chiropractors & Organizations (IFCO) the Illinois Prairie State Chiropractic Association, the Michigan Chiropractors Association and the New York Chiropractic Council to name a few. Not to be outdone in outrageousness, Chiropractic Australia has taken it a few steps beyond the nonsense in the United States. 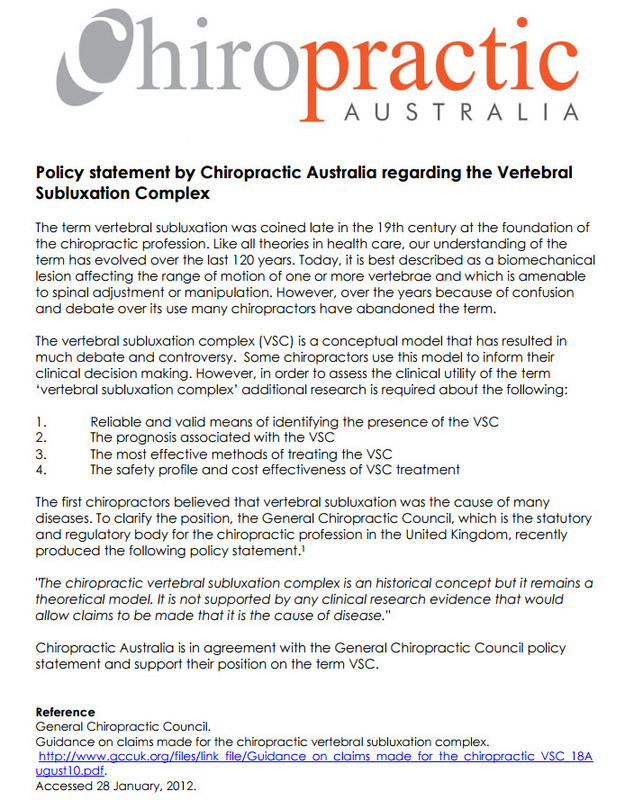 Chiropractic Australia asserts that taking x-rays for non specific spinal pain, telling a patient anything that might be "negative", using verterbal subluxation as a cause of disease, or taking x-rays for subluxation analysis ". . . exposes the consumer to undue risk of harm, emotional stress, or financial cost." The Australian government has already said "no" to full spine x-rays by chiropractors last year and subluxation focused practitioners have generally been under attack by subluxation deniers for several years. Chiropractic Australia says it has been working for many months on a submission to the Choosing Wisely Australia campaign and that they undertook consultation and feedback from the profession. The following are Chiropractic Australia’s submission points for Choosing Wisely Australia . . .
Avoid requesting medical imaging, such as X-rays, for non-specific spinal pain without indication of a pathological cause. Avoid the use of negative, emotive or ‘fear inducing’ language or behaviour, in practitioner to patient communications. Avoid any program of care that is not patient-centred and evidence based and does not incorporate the use of validated outcome measures, especially for long-term treatments. Avoid using the terms ’vertebral subluxation’ or ‘spinal dysfunction’ as a cause of disease. Only request 3-4 region spinal x-rays where there is indication such as serious disease, trauma or for the identification and monitoring of scoliosis. Australian chiropractors who practice in a subluxation model are encouraged to speak out against the submission and adoption of these standards and these anti-subluxation groups.